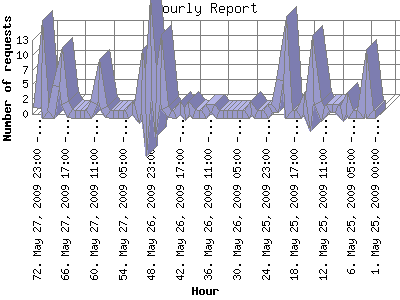 The Hourly Report identifies the level of activity for each hour within the report timeframe. Remember that one page hit can result in several server requests as the images for each page are loaded. Most active hour Dec 22, 2008 03:00 - 03:59 : 33 pages sent. 12 requests handled. Hourly average: 1 pages sent. 3 requests handled.